← What? Groundhog’s Day, you say?! You might be surprised to find out that You Life is fully employed by an outside agency. And it isn’t as a representative for a spirits distributor. No, my daytime job is both bureaucratic and depressing. I am like a latter, female, Harvey Pekar (without the cancer, RIP dude). And like any office job I am required to password protect…well, everything. And then change my password. After all the typing, and passwords, and computers, and numbers I begin to feel more like a slightly sentient robot than a human. 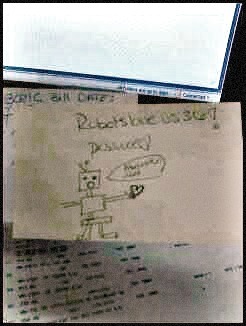 So I made a new password to reflect that: Robots love us! When the computers become self-aware I will be their vessel. Hear me, oh robot gods! I bow down to you in advance, Queen of Robot Gods. This is my fave You Life… post yet!